The beginning of Marcy’s life was spent as a puppy producer for her master. After becoming unhealthy due to lack of nutrition and exercise, her owner then quit breeding her and left her alone, chained in her backyard, because she no longer served her purpose. She has spent the majority of her life on a chain, tucked behind the home and humans that discarded and forgot her. A chain-link enclosure, a weathered torn plastic tarp and thin plastic doghouse, and a hole she dug in the dirt, are the only shelter from the summer sun and the winter winds, all taking a toll on her frail body. I know Marcy’s story because I came across her while looking for stray sin the Walnut Park neighborhood of North St. Louis. I saw her from the alleys where I searched for strays rummaging through the dumpster. I noticed how skinny and depressed she was. At this time, in my dog rescue journey, I was very focused on getting the strays off the streets, sometimes I was catching two a day. Rolling through the alleys is when I realized the abundance of starved dogs on chains in people’s backyards left out to rot. Marcy’s face told a sad lonely story and so I began coming through regularly and bringing her food and tossing her milkbones. This all started in the fall of 2017. Marcy would get up and come out at the sound of my truck tires, knowing her belly would be filled. Soon the neighbors figured out that I was going onto their property to feed her so they put up a 6-foot chain link fence and padlocked it. Now, I could only throw her treats from the alley and that wasn’t enough. I had to help her so I started dropping off bags of food on her owners porch. I eventually tried to build a relationship with the owner and offered to buy Marcy or at least help her get the vet care she needed. Eventually, her owner quit answering the door when I knowcked so I just left supplies on the porch. Winter was tough. I got the feeling none of the food, or very little of it was getting to Marcy because the woman had other pets inside her home. The bowls and toys I got for her never made it out to her. I would sneak into the neighbors yard to feed her over the fence. Summer 2018 was terrible. This is when i started contacting the Citizen Service Bureau in St. Louis City and making reports. She was being eaten alive by mosquitoes and flies feeding on the tops of her ears and the back of her rear end where she couldn’t scratch. She had huge gaping bleeding wounds on the tops of her ears from scratching her ears to keep the flies away and because of the itching, you can still see and feel the scars today. As time passed, she simply became too frail and weak to greet the sound of my truck. I called the Citizen Service Bureau again to do an animal welfare check and never heard anything back. I threw treats in the yard and she never came out. I did not see her at all that fall. I figured she passed. I continued to take food because I knew they also had a dog that lived inside. Before the severe cold of January 2019 I noticed the neighbor on the other side’s gate was broken. I went in their backyard and saw Miss Marcy shivering and in far worse shape than I had ever seen before. She was shivering and shaking and I knew with the sub zero temps coming she wouldn’t survive much longer. I made a plea on the Saving St. Louis Pet Facebook page and the whole animal rescue community came together to save her. Upon her rescuers arrival, she was cruelly chained, starved and nearly dead. She could hardly stand. yet, she was sweet and loving. 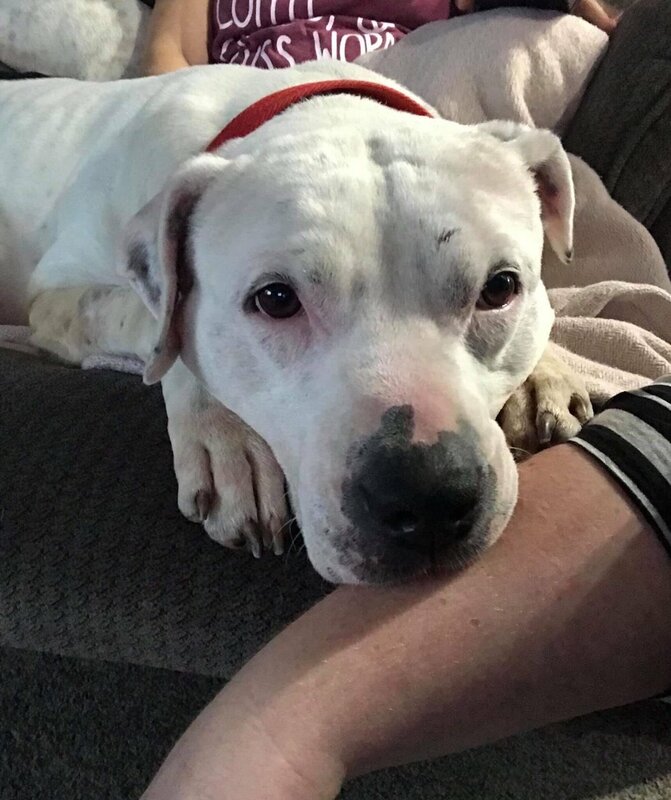 A very new rescue named Diamonds in the Ruff Rescue located here in St. Louis immediately started scrambling to get her the care and funding she needed to start her rescue journey. At the same time another life-long chained American Bulldog named Max, who I had been taking food to, in Wellston. Hi owner did not want him anymore and “set him free.” I noticed this guy was off his chain and roaming the neighborhood, but he wouldn’t let me catch him. I put out another plea on Saving St. Louis Pets on Facebook again. The rescue community answered and he was picked up the next day! Diamonds in the Ruff Rescue also brough him into their rescue. He too has testted positive for heartworms. He is doing great in his foster home and loves other dogs and children. Both Max and Marcy have secere separation anziety and the rescue has had to purchase special kennels to house them. These kennels are hand-made and reinforced with extra welds at the joints and have a metal bar lock system instead of your typical latch. They weren’t cheap. Marcy’s big heart kept her alive. Now we need to heal her mind and body. 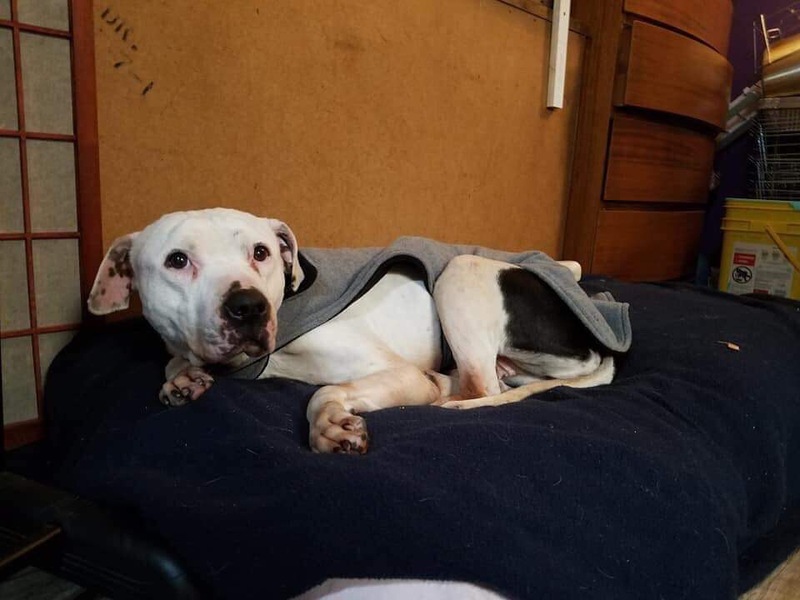 Marcy has tested positive for heartworms, she also has frostbite on the end of her tail which will require amputation as well as her spay surgery on March 6th. Sfter she has fully healed from the surgeries she will begin to start her heartworm treatiments which for her and Maz will reach into thousands. She is slowly but surely coming our of her shell. She is still timid and anxious but that will heal with time. If you can help, even if it’s $5, it’s $5 further than we were. Every little bit counts. Please help if you can. There are more pictures of marcy as well as the video of her that set the animal rescue community on fire on our Go Fund Me page. Diamonds in the Ruff Rescue is a 501c3 nonprofit, foster-based rescue. We are here to help those with no voice find safe loving homes.